This issue is now on its way to subscribers around the world! I just got back from taking the majority of the issues to the post office, and I'll be finishing up the last few within this coming week. Lord willing, subscribers will receive their copies by September 1. A number of excellent articles were submitted for this issue. I've been challenged to take a bolder stand for the cause of Christ, and I trust these articles will inspire you in the same way. Lessons learned from the trial God placed in my life this summer. Have you ever struggled with loneliness, wondering if you'll ever find a true friend? Nearly five pages of excellent, Scripturally based answers to this problem are shared in this issue, and three more answers may be read online here. Encouragement from one who has struggled with "different" from the rest of the world. Thoughts on being a good role model without being "self righteous." Lessons from the life of Daniel, who purposed to stand alone even in "little" areas like diet. 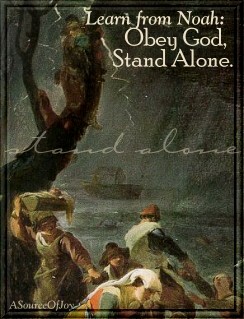 A young reader shares what the Lord taught him through a time of standing alone. Even when we feel that everyone is against us, God is still on our side! A true testimony from the heart of a girl who struggled and yet made the right decision -- to stand alone for God's truth. In this, the final installment of my autobiography (for a while, anyway), I tell about our adventures through the fall of 1992 -- a trip to Oklahoma, California visitors, repainting the house, and more! Includes diary excerpts and photos. Don't miss chapter three of this insightful story of Abigail and Nabal, as seen through a servant's eyes. Sarah C.'s excellent illustrations again add much to the story. Three books are recommended this time; check them out! We all face times of uncertainty, when we're not sure where the Lord is leading. Jana shares her experiences here, and how God gives peace no matter where we are. A selection of practical ideas on how to brighten others' days; includes an encouraging poem to share with someone going through a hard time plus 15 more practical ideas from subscriber Danielle R.
In this issue we get to meet Anna Kirk and her joyous family of nine. :-) Includes two photos. HW food editor Katherine N. has prepared a delicious selection of reader's favorite fall vegetable recipes. Enjoy! The daily Bible readings for September and October are found in Proverbs, Ecclesiastes, Song of Solomon, and Isaiah. The selections are brief enough that anyone can use them to help maintain a daily quiet time. A selection of quotes and poems submitted for this theme didn't fit in the printed issue, so I've included them here. Check them out!